Today, Jesus teaches about the kingdom of heaven in parables that are so clear, even the apostles understand them. The Gospel reading gives us another cluster of parables about the kingdom of heaven, adding to an unusually high number in just one chapter. The first two are very similar. 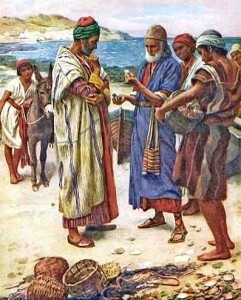 In one, the kingdom is compared to a “treasure buried in a field.” The one who finds the treasure immediately recognizes its great value, so he hides it again, for safe-keeping, and “out of joy goes and sells all that he has and buys that field.” He is thrilled with the prospect of the riches the treasure will bring him. Knowing its value, he has no trouble selling all his other possessions. Nothing he currently owns is worth more than the treasure in that field. In the next parable, a merchant is out searching for fine pearls. He finds one of staggering quality; he, too, “goes and sells all he has and buys it.” He knows that the pearl of great price will more than compensate him for whatever losses he has to count. What is the message here? The comparison Jesus makes between the kingdom of heaven and great earthly treasure helps us understand that the call to repentance and conversion is worth whatever we have to give up in order to respond to it. Jesus is not talking specifically about selling all our possessions in order to follow Him, but He is making it clear that we always get more than we give up in discipleship. Some of us are called to literal poverty in order to follow our vocation; all of us are called to self-renunciation in our vocation as His disciples. If we are honest, our love of self is even greater than our love of our stuff (we love the stuff because we love ourselves). These parables remind us that the treasure of attaining the kingdom of heaven will dwarf our “losses” along the way. Because we are such earthbound dust, we are vulnerable to forgetting this. We need all the reminders we can get. The last parable in our reading returns to the idea expressed in an earlier one about wheat and weeds (Mt 13:24-30). In this one, the kingdom of heaven is “like a net thrown into the sea, which collects fish of every kind.” When the fishing expedition ends, the good fish of the haul are separated from the bad. Jesus says this final evaluation is how “it will be at the end of the age.” It is an image of the final judgment. The emphasis here, as in the earlier parable, is that, for a time, the good and bad are all mixed in together. The kingdom of heaven, which is the Church on earth, will have both good and bad. When we see this, we need to have confidence that a just rendering will one day take place. This keeps our attention on ourselves, making sure we are ready for it, and not on our neighbor, whom we are tempted to suspect isn’t. That decision is, fortunately, not ours to make. In a rare moment, Jesus then asks the disciples, “Do you understand all these things?” We are so used to them not understanding that perhaps we are surprised by their unqualified “yes.” It is easy to second-guess them, isn’t it? Did they really get it, or were they just saving face? Jesus doesn’t quibble with them. He goes on to announce, “anyone instructed in the kingdom of heaven [He uses the word “scribe” for this] is like the head of a household who brings from his storeroom both the new and the old.” This can sound mysterious, but Jesus is simply saying that the apostles, in preaching the Gospel to the world, will use truths from both the Old Covenant, revealed in the Old Testament, and from the New Covenant, revealed in Jesus. Often, they will be the same, as we will see in several of our other readings. Possible response: Lord Jesus, help me remember that following You is the pearl of great price, worth more than all my distractions. In this reading, we find an example of a man who understood that the greatest treasure a man can have is one that makes him rich in goodness, not possessions. Solomon had just ascended to the throne of his father, David. He was humbled by the responsibility of governing God’s people. When God said to him, “Ask something of Me, and I will give it to you,” Solomon asked for the wisdom he new it would take (and knew he didn’t have) to govern with understanding and justice. The request pleased God, because Solomon had not asked anything for himself. The self-renunciation of his request showed him to be a man who longed for the pearl of great price (in this case, wisdom). For him, that had more value than anything temporal. For us, this is an “old” treasure from the storeroom of Israel’s covenant with God, very much like the “new” treasure of Jesus’ wise parables. Possible response: Heavenly Father, I want to desire Your wisdom as deeply as Solomon did. These two readings help us see that Jesus, in His parables, was often teaching an old truth in a new form. Some of God’s people had become dull of hearing; the parables help them (and us) to stay awake and think. Possible response: The psalm is, itself, a response to the other lectionary readings. Read it prayerfully as your own. St. Paul helps us understand why the kingdom of heaven is the pearl of great price. To live in its light is to perceive ourselves and everything in our lives in an entirely new way (this is what Jesus meant by the “new” from the householder’s storeroom). In His kingdom, we recognize that God is always at work for good in the lives of those who love Him. That is because God has always had a plan for us: He gave us a destiny before we even existed (a “pre-destiny”). His purpose in creating us is to conform us to the image of His Son. To accomplish it, He will justify us (cleanse us of all our sin) and glorify us (make us like divinity). What man, knowing that this is what possessing the kingdom of heaven will mean for him, would not, with joy, renounce anything and everything that might keep him from it? Possible response: Heavenly Father, when I see Your plan so clearly expressed here, I wonder why I ever bother with worry or fear.